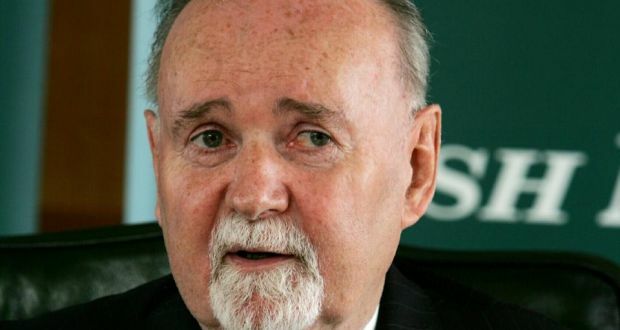 Former Irish Nationwide chief executive Michael Fingleton will insist the building society was solvent on the night of the bank guarantee, despite the fact that bailing it out would eventually cost the State more than €5 billion. In evidence to the Oireachtas Banking Inquiry next week, he is expected to strongly criticise the financial regulator and say AIB and Bank of Ireland’s attempts to have INBS nationalised on the night of the guarantee was an opportunistic move to remove a competitor. In a 23-page written statement to the inquiry, Mr Fingleton is understood to robustly defend himself and the building society he led for 38 years. However, it is believed he does not offer an apology in the correspondence for his role in the collapse of the institution. Mr Fingleton stepped down from INBS in early 2009. A year later the institution faced the first of two recapitalisations by the State, involving a total bailout of €5.4 billion. The Central Bank is investigating allegations that certain proscribed contraventions were committed by INBS, and certain persons concerned with its management, between August 2004 and September 2008. During Mr Fingleton’s tenure, Irish Nationwide moved away from normal building society activity and developed a major commercial property portfolio which was to lead to its collapse. Mr Fingleton, who is due to appear before the inquiry next Wednesday, is expected to insist that INBS was solvent on the night of September 29th, 2008, when the bank guarantee was agreed. INBS had in excess of € 3 billion in cash and €1.5 billion in capital and the regulator had agreed it was solvent, he is expected to say. Mr Fingleton is expected to claim there was no justification for the suggestion that INBS be nationalised. He will also claim Allied Irish Bank and Bank of Ireland suggested it in an attempt to eliminate the competition and allow them to pay lower deposit rates. It is understood he will argue the institution had managed to reduce the size of its loan book from €12.3 billion to €10.4 billion by the end of 2008. Mr Fingleton will quote then minister for finance Brian Lenihan, who said in November 2008 that INBS was doing a good job. He will also tell the inquiry a significant share of the blame should be apportioned to the office of the financial regulator. He will list a number of moves it could have made – including introducing limits on lending growth. He is expected to say that the regulator had all the powers to implement measures but did not.